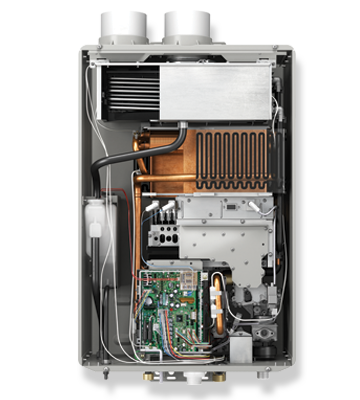 Prestige condensing tankless gas water heaters | WELCOME TO AIR CAROLINAS - YOUR LOCAL COMPANY Breath Fresher. Live Longer. You never know what the day will bring. 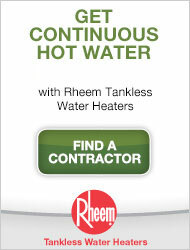 That’s why so many people are choosing RHEEM TANKLESS water heaters. You can load the laundry, start the dishes, bathe the kids and even relax in a hot bubble bath of your own – all without ever running out of hot water. And with an efficiency rating of up to 94%, you’ll save on energy costs too. So you’re always covered, no matter what the day has in store. Tankless water heaters are a great fit for many homes. And, many utility companies offer rebates for switching from electric water heating to gas water heating – check for opportunities in your area to make continuous hot water even more affordable. If you have a busy family at home a Rheem Tankless water heater makes loading the laundry, starting the dishes, bathing the kids and even relaxing in a hot bubble bath of your own – all without ever running out of hot water – a reality. If you have or plan to install a luxury bathroom or garden tub, a Rheem tankless water heater will give you the hot water you need to bring your dream bathroom to life. If you own a vacation or second home, a Rheem tankless water heater can provide significant savings by not paying to heat and reheat water as you would with a traditional water heater when you are away from the home.